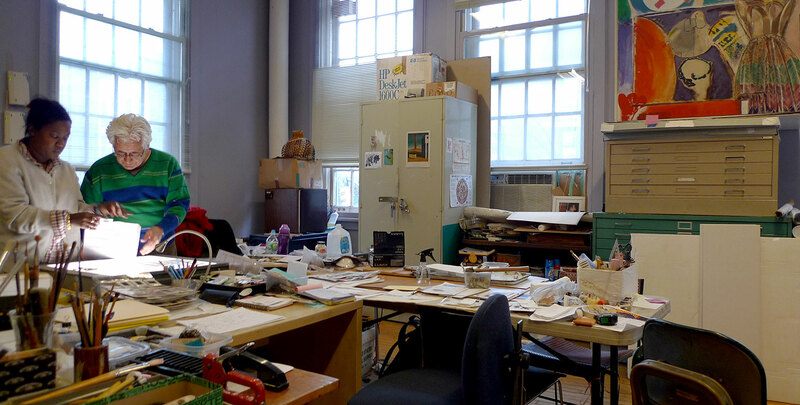 Creating a Living Legacy (CALL) is an initiative of the Joan Mitchell Foundation which recognizes that artists of all ages may need support to organize their studios and take charge of their creative legacies. CALL provides a comprehensive suite of resources to help artists create usable documentation of their artworks and careers, manage their inventory of artworks, and start the legacy and estate planning process. After a number of years of field testing—in which emerging artists were trained by the Foundation to assist older artists with career documentation—the Foundation has expanded the vision for CALL, and makes its resources widely available through free workbooks and online toolkits. Legacy Specialist Alex Unthank working with CALL Artist Marcos Dimas in his studio.